An amazing picture of the aurora borealis – the Northern Lights – shows how the phenomenon can light up the sky near the North Pole. This weekend was set to be a bumper time for viewing the extraordinary apparition, thanks to unusual solar activity. This picture was taken above Yellowknife, a city in Canada’s Northwest Territories. 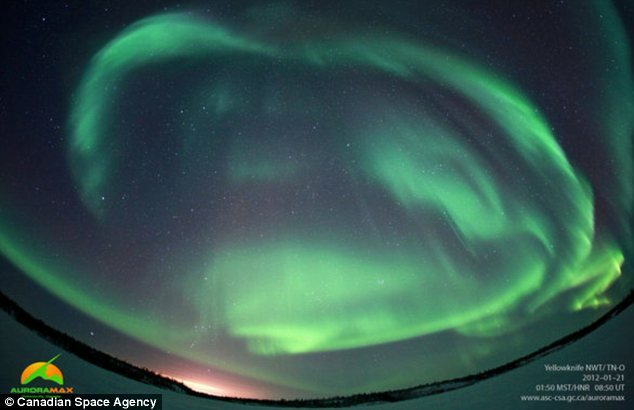 The image was published as part of the AuroraMAX project, an initiative by the Canadian Space Agency which aims to help the public experience the wonder of the Northern Lights. AuroraMAX project has been timed to coincide with the next solar maximum, the period when solar activity reaches an 11-year high, forecast to come in February 2013. The solar maximum causes an increase in the number of sunspots and in the geomagnetic activity which causes the aurora borealis and its South Pole equivalent, the aurora australis. A short-term version of the same effect is set to occur on Sunday afternoon, when a blast of solar activity reaches the earth. On Thursday astronomers noticed a coronal mass ejection, a burst of electrically charged particles thrown out by the sun. Three days later, the storm will pass close to the earth, causing an upturn in the prevalence and extent of the aurorae. In the past, similar incidents have caused the Northern Lights to be visible as far south as Virginia and Arkansas.